One of Vietnam's most popular destinations, Ha Long Bay is a breathtaking place of scenic beauty and scientific intrigue. Located in the Gulf of Tonkin in the north east of Vietnam, Ha Long Bay features a spectacular collection of almost 2000 limestone islands which rise majestically from the azure sea. Regarded by proud nationals as the 'eighth Wonder of the World', Ha Long Bay boasts incredible biological diversity and hosts thousands of species of animals and plants. The area's most densely concentrated zone of islands, additionally renowned for its picture-perfect scenery of beaches, caves, forests, reefs and grottoes, was declared a UNESCO World Heritage Site in 1994. The sharp incline characterising many of the islands means they are uninhabited, and sailing through the labyrinth of watery channels feels like a mystical step back in time. While boat trips and cruises could keep you occupied for days, there is a wide range of other things to do in the area. Indulge in the delicious seafood, swim in the clear waters, explore a national park or cave, go fishing or sample the delights of Ha Long city. Whatever you choose to do, your experience in Ha Long Bay will be memorable. 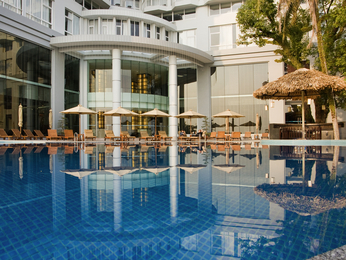 Novotel Ha Long Bay stands tall as the premier beachfront hotel in Ha Long City. The family hotel is close to the most popular attractions including bay cruises, local markets and other commercial attractions.